ESAF Small Finance Bank invites online applications for recruitment of Branch Heads, Assistant Branch Heads and various Officers for filling up above 3000 vacancies. ESAF Bank Recruitment Notification 2018 has been published in April 2018. Other details like age limit, educational qualification, selection process, application fee and how to apply are given below. 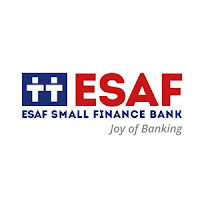 About Bank: ESAF Small Finance Bank is a small finance private sector bank promoted by Evangelical Social Action Forum. ESAF Bank headquartered at Mannuthy, Thrissur. Summary: ESAF bank authority is inviting the eligible contenders to apply for their latest recruitment for the 3000 posts of Sales Officer, Credit Officer, Relationship Officer, and Branch Head & Assistant Branch Head Vacancy Kerala. Candidates who want to apply for this ESAF Bank Vacancies in Kerala must have completed their graduation. Candidates must have to submit their online application form till 21st May 2018. The age limit of the candidates must be between 21 years to 40 years. Selection of the contenders will be made on the basis of test and personal interview. All the contenders must have completed their Graduation/Post Graduation in the relevant discipline from any reputed college / University. For gathering the post wise qualification details all the candidates are advised to refer it from the official recruitment notification. According to the official ESAF Bank Recruitment 2018 Notification, all the candidates must have the age limit between 21 years to 40 years. For gathering the age relaxation details all the candidates are advised to visit the official recruitment advertisement. The details regarding the application fees will be available at the detailed advertisement. All the selected candidates into this ESAF Bank Recruitment 2018 will be given the monthly salary on the basis of their qualification, experience and performance in the selection rounds. First of all go to the official web portal of the bank authority. Next click on the official link to apply online for this ESAF Bank Recruitment 2018. Carefully fill the online application form. Scan and uploads all the major documents. Finally submit and takes the hard copy of the online application form.